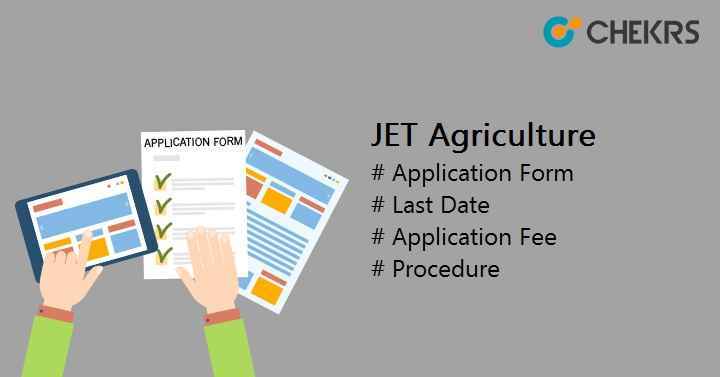 JET Agriculture 2019 Application Form: Joint Entrance Test (JET) Agriculture is an entrance test conducted for those candidates who have interest to pursue their career in Agriculture & Technology. This exam is managed by Maharana Pratap University of Agriculture and Technology (MPUAT), Udaipur. The university provided various courses in the field of technology such as Dairy Technology, Food Technology and other professional courses also. Candidates can get admission after qualifying the entrance exam. To appear in JET Agriculture 2019, students will have to fill the Rajasthan JET Agriculture Application Form. Here we have mentioned all the information related to application form, eligibility, exam dates etc. Applicants must have studied for the last three years as a regular student in the qualifying examination in recognized institution of Rajasthan. Parents of candidate (either Father or Mother) must live in Rajasthan for a period of last 10 years and candidate has studied for at least 5 years during this period from any recognized institution/schools of Rajasthan state. The candidate must be bonafide resident of Rajasthan. He/ She may be presently studying in any of the states other than Rajasthan. The Children of the Judge of Rajasthan High Court will have to submit an undertaking/affidavit declaring that such benefit has not been claimed or taken by them in any other State. Son/Daughter of serving or retired employee of Paramilitary Forces of India, retired or permanent employee of Indian Defense Service of Rajasthan origin must be posted in Rajasthan at the time of last date of the application for admission. Any of the Universities in Rajasthan or Board of Secondary Education, Rajasthan provided that the employee has worked in Rajasthan for three years preceding duly constituted by the Government of Rajasthan by an act of Law the last date of submission of the application. Student must have passed with minimum 50% aggregate in marks in 10+2 from any recognized board, Ajmer board/university or Rajasthan board with agriculture, biology, chemistry, physics and mathematics subjects i.e. PCM, PCMB, PCB, PCA, Ag. Stream etc. For SC/ST, there will be relaxation of 5% in aggregate marks. Candidate’s age must not be more than 25 years as on 01.01.2019. Applicants will not be considered in unreserved category who will take the advantage of 5% relaxation. Keep all relevant documents ready before filling the application form. Some documents need to be uploaded during form filling process. Check here list of all scanned documents. Paste photograph of dimension 5 (height) x 4 (width) cm on a white, plain paper. Candidate must sign below the photograph in dimension 2 (height) x 4 (width) cm size. Scan the paper and upload at the time of image uploading during application form filling. Scan Mark sheets of class 10th & 12th. Upload it in pdf format in size 100 – 200 KB. Candidates also scan and upload all other documents like caste certificate, physically challenge certificate in pdf format in size 100 – 200 KB if required. Visit the official site of Rajasthan JET i.e. rcaudaipur.com. Click on “Application Form” given on the left side of the home page. Read the given instructions carefully and then click on proceed. Fill the details like candidate’s name, mobile no, mail id etc. After this, registration no will be generated. After this, Candidate login into the account with the generated registration no, and password, select examination type and then click on “Login” button. Fill the application form with all required details like personal, educational, communication details etc. and then click on submit. Upload the image & documents as per given instructions. Pay the application fee through online mode via credit card/ debit card/ net banking. Take the print of application form after submitting the application form for future use.